The World's Only Moosejaw Pizza! Breakfast Buffet runs Saturday & Sunday in the off season. From Memorial-Labor Day, the buffet will run EVERY DAY! 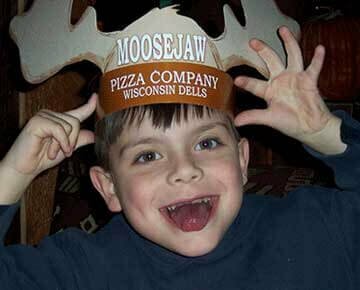 Locally owned, Moosejaw Pizza & Dells Brewing Co. is centrally located between Chicago & Minneapolis in the heart of Wisconsin Dells, Wisconsin. Moosejaw seats 600+ customers within the 3 levels of our full service restaurant which specializes in fresh, piping, hot pizzas (with dough made fresh daily)! Moosejaw also features freshly prepared comfort foods such as burgers, pastas, salads, sandwiches, entrees & kids’ meals. With Moose Antlers to wear, 3 bars & a large arcade, we are sure to become a Family Favorite! 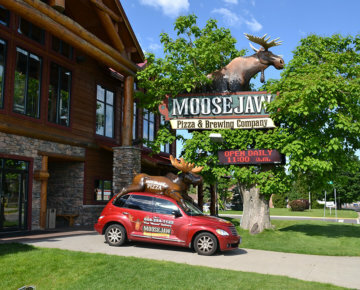 Moosejaw is Wisconsin Dells’ only brewpub! Our hand crafted brews travel straight from our brew tanks to your glass…now that’s what I call fresh! We feature 12 Microbrews on Tap plus we bottle & can our favorites on-site, so you can take home brews to enjoy after your vacation. Stop in for a sample, stay for a pint & take home a 4 pack, 6pack, 12 pack or growler of Wisconsin Dells Brewing Co. microbrew (you can even mix & match)! And don’t worry, we have Classic Sodas available in bottles to go, too. We love large groups, sports teams & all of your extended family, but we don’t take reservations at Moosejaw, it’s first come, first serve. If you’re looking to book a private room for your group of 20 or more, contact Group Sales to tell us about your needs. Otherwise, just head on in & we’ll take care of you like you are family (from the side that we like)!